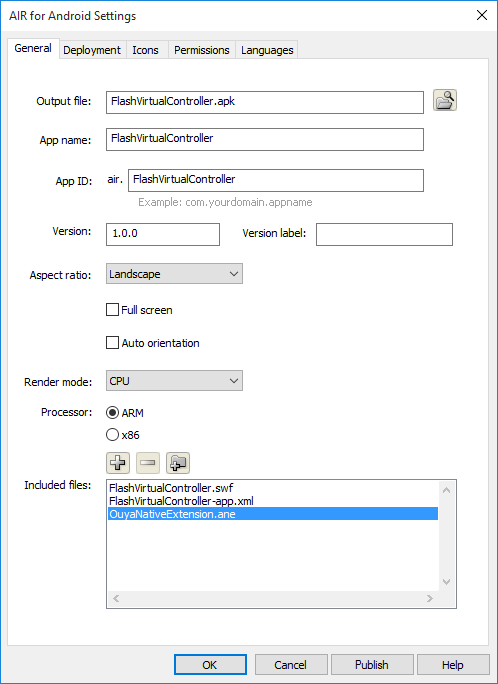 When compiling FlashDevelop, Flex, and the AdobeAirSDK you'll want to increase your Java Virtual Machine memory size. Normally the default is 384MB but you can increase to 1GB or higher java.args=-Xmx1024m. There are several locations where the jvm.config is configured. The FlashDevelop FAQ needs your JAVA_HOME to point the JDK6 (32-bit). ANE Extensions wrap Java libraries so they can be invoked from Adobe Air ActionScript. The Java JAR needs to be compiled first before it can be wrapped in an ANE Extension. Gradle will compile the Java Extension code into AirOuyaPlugin.jar. The AirOuyaPlugin.jar will output to the jar extension folder. The jar folder also contains FlashRuntimeExtensions.jar (from the AdobeAirSDK download) and ouya-sdk.jar (from the ODK). The extension interface is the piece between Java and ActionScript and was created using a FlashBuilder project. After the builder project has imported, Adobe Builder will auto compile the SWC file which is needed any time ActionScript is changed in the ANE. 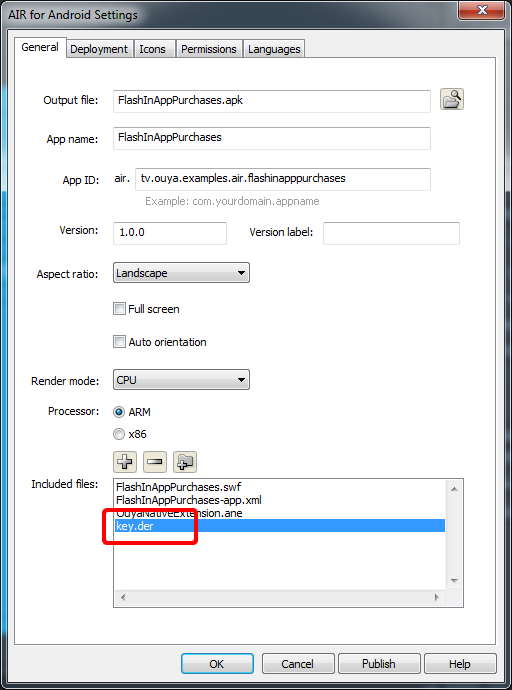 1) In Flash Builder choose the File->Import Flash Builder Project menu item. 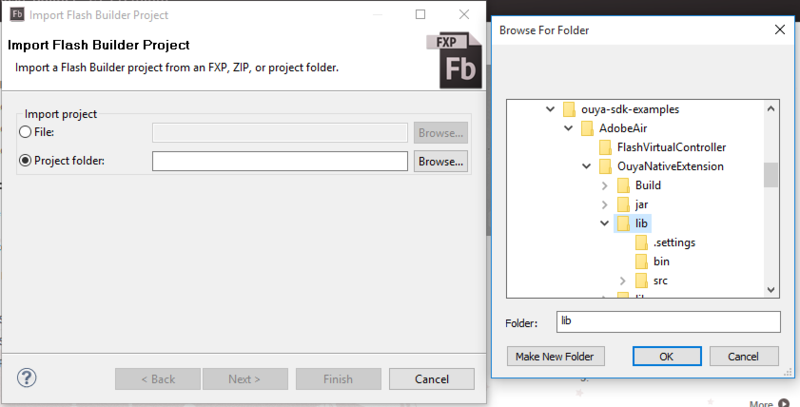 2) Choose Project Folder, browse to the AdobeAir/OuyaNativeExtension/lib folder, and click OK.
3) After making changes to ActionScript switch back to Flash Builder which will auto-generate a new SWC file. 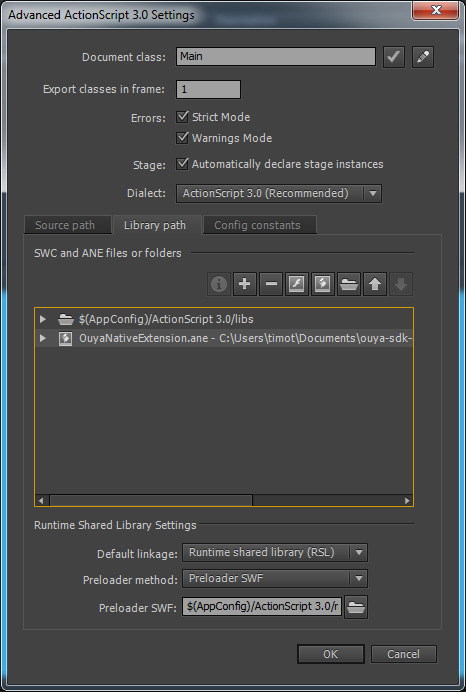 4) Building the ANE from script will embed the SWC file. build_ane.cmd will package the OuyaNativeExtension.ane on Windows. Be sure to customize the paths for JDK and AIR_SDK pointing at the AdobeAirSDK in the build script. 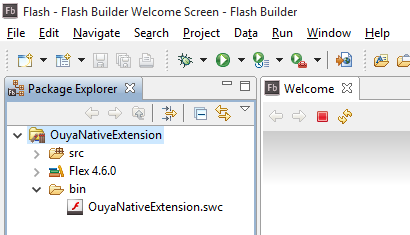 The OuyaNativeExtension.ane should be used as a library after placing in the following folders in a FlashDevelop project. For the debug extension folder, extract the contents of OuyaNativeExtension.ane into a subfolder named OuyaNativeExtension.ane. Add the OuyaNativeExtension.ane extension to your application's extensions. Add the ANE extension's MainActivity within the application section of the application.xml. This will be a second activity after the existing Activity block. 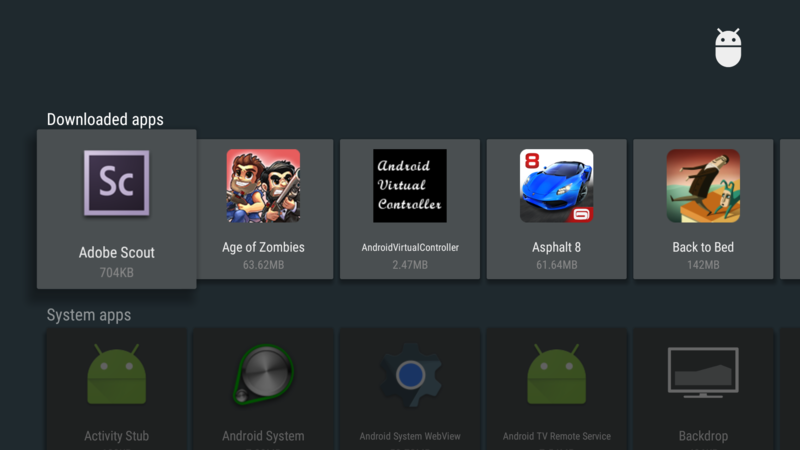 Import the packages to use the OUYA Native Extension. Initialize the OuyaNativeInterface to use OUYA-Everywhere Input. The OuyaNativeExtension.ane extension must be added to your project. IsAnyConnected will return true if any controllers are connected, otherwise false. IsConnected will return true if the playerNum controller is connected. GetAxis will return the Number value for the supplied playerNum controller and axis. GetAnyButton will return true if any controller is pressing the button. BUTTON_MENU should only be used with ButtonDown and ButtonUp events. GetAnyButtonDown will return true if any controller detected a pressed event on the last frame for the button. GetAnyButtonUp will return true if any controller detected a released event on the last frame for the button. GetButton will return true if the playerNum controller is pressing the button. GetButtonDown will return true if the playerNum controller detected a pressed event on the last frame for the button. GetButtonUp will return true if the playerNum controller detected a released event on the last frame for the button. ClearButtonStatesPressedReleased will clear the detected pressed and released states to allow detection for the next update frame. The following steps setup the Main.as ActionScript file to load at start-up to initialize the OUYA native extension. 1) Switch to the selection tool and left-click on the stage to select the document. 2) In the Property window change the Class field to Main to reference the Main.as. 3) Also set the document size to 1920x1080. 4) To the right of the Class field there's an edit button to open the existing Main.as or use the file menu to create a new Main.as action script document. 5) Create a bare-bones Main class. When the application starts, the first thing that will be called is the Main constructor. 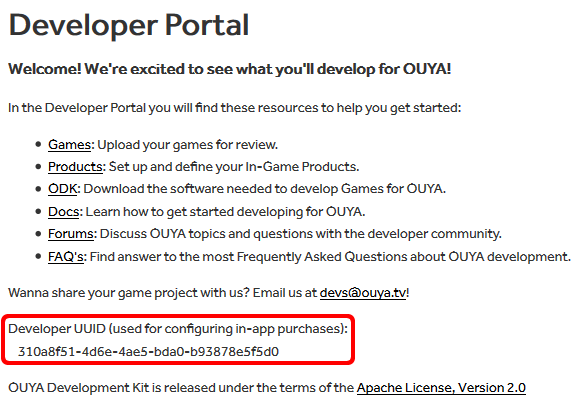 6) Add code to load the OUYA native extension and save a reference to the native interface. 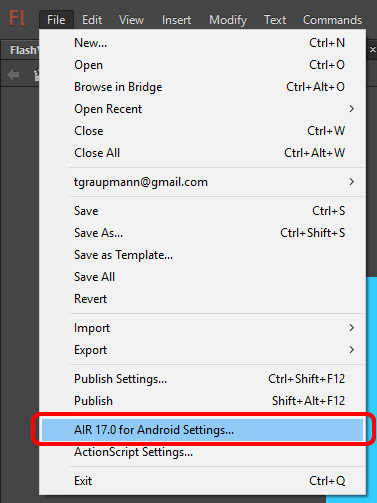 7) Open the File->Air 17.0 for Android Settings menu item. 8) On the Deployment tab, the Certificate field must be set. You can either browse to an existing p12 certificate or create one with the Create button. This field must be set before clicking the Publish button. If Remember password for this session is set you can publish directly from the File->Publish menu item. Publishing will produce an APK file which can be installed on the command-line. 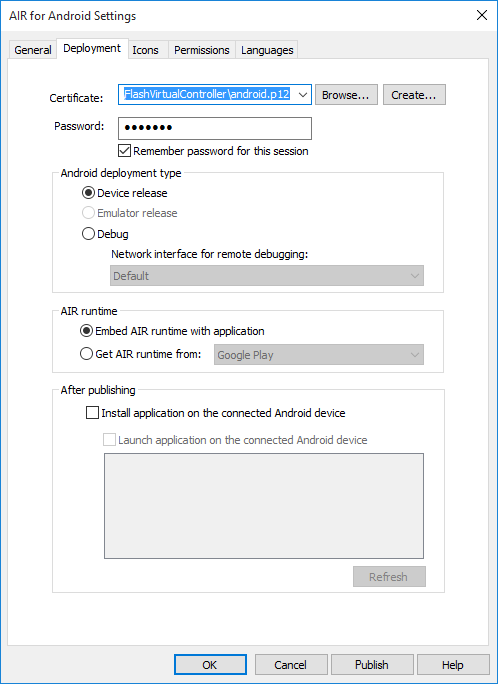 All the Flash examples use android for the certificate password. 9) On the General tab, the App ID field should match the package identifier that was created in the developer portal. Notice that Adobe-Air apps are always prefixed with air. 10) Select the ARM processor and click the + button to browse to the OuyaNativeExtension.ane copied to your project folder and click OK.
11) When publishing, the extensions section will automatically appear in your project's ApplicationName-app.xml file and that section cannot be edited manually. 11) Edit your project's ApplicationName-app.xml to add the following manifest additions. 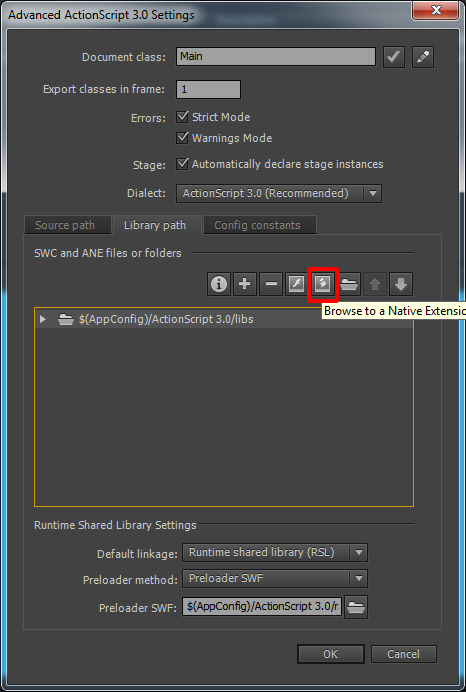 12) Open the File->Open ActionScript Settings menu item. 13) On the Library Path tab, click the Browse to Native Extension button to select the OuyaNativeExtension.ane file in the project folder. 14) With the OuyaNativeExtension.ane added to the library path, click OK. This setting uses an absolute path and if the path is different then the path will need to be reset in order to publish. 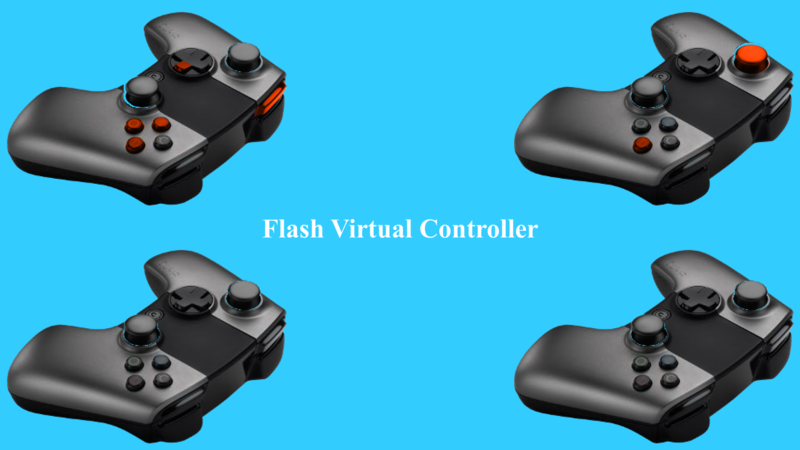 The Flash Virtual Controller example shows 4 images of the OUYA Controller which moves axises and highlights buttons when the physical controller is manipulated. 1) The Virtual Controller example modifies the Main.as ActionScript to add an update event that will later control sprite visibility. 2) In the update event, ClearButtonStatesPressedReleased will clear the button pressed and release states each update frame. 3) The update event can fire hundreds of times per second, where the input can be checked far less often. Use a time limitor to throttle-down checking input. 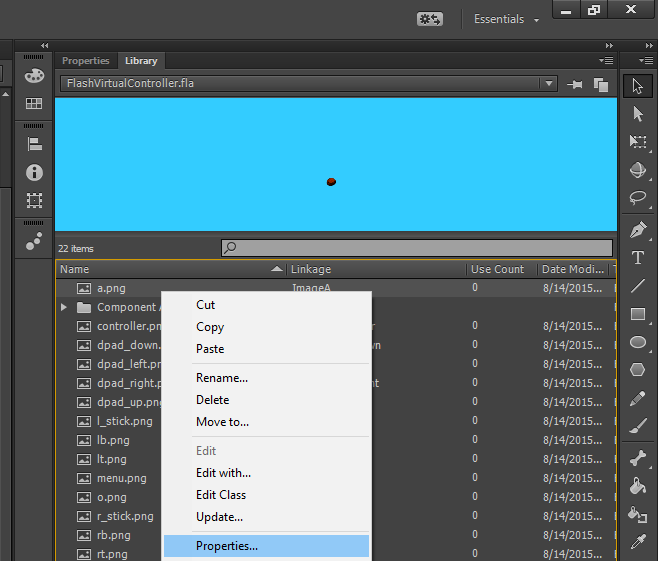 4) The VirtualController object is used to create sprites for each of the virtual controllers on screen. 5) The VirtualController object uses the native interface in the Update method to access axis and button values for the controller. 6) The sprites used by the example are first imported to the library from PNG files. Use the File->Import->Import to Library menu item to select the images in the project folder. 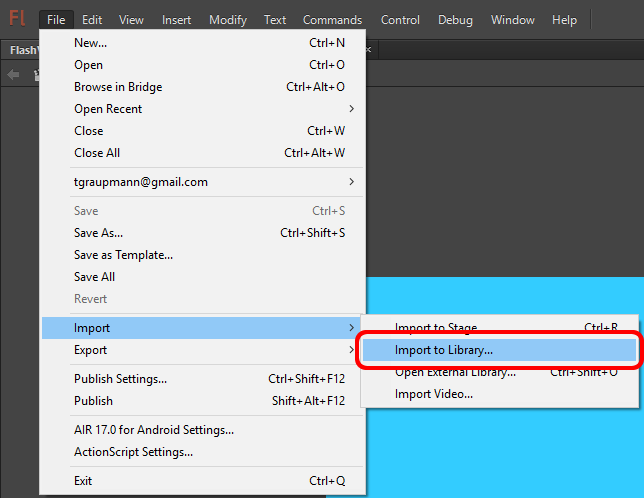 8) Switch the the ActionScript tab and enable Export for ActionScript and Export in frame 1. Set the Class field to a name and be sure to capitalize the first letter by convention. Click OK. Repeat for all of the image sprites. 9) The VirtualController constructor keeps a reference to the Main object and the OuyaNativeInterface object. The Main object is needed to dynamically add children to the stage document. The PlayerNum argument corresponds to the OUYA controller number. The x and y parameter indicates where to instantiate the Bitmap objects on the stage. 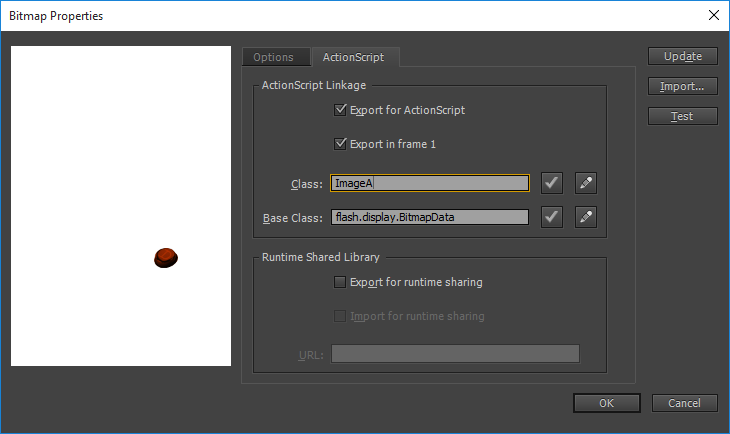 10) The VirtualController constructor uses a helper method to add scaled sprites to the stage document. 11) The VirtualController constructor instantiates the sprite objects from the library. 12) The Update method uses a helper method to update Bitmap visibility. 13) The Update method uses a helper method to move the left and right stick sprites. 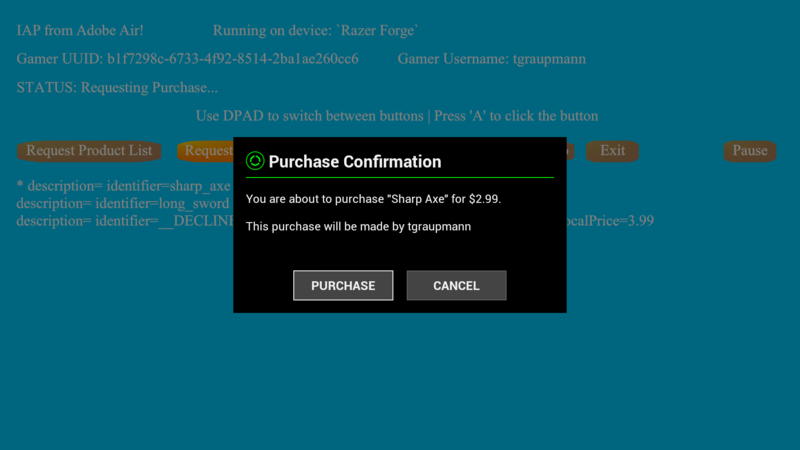 The In-App-Purchases example uses the ODK to access gamer info, purchasing, and receipts. 1) Log into the developer portal to record your developer UUID to configure in-app-purchases. 2) In the Games section of the developer portal create an entry matching your package name matching the air prefix. Download the signing key for the game entry into your Flash project folder. 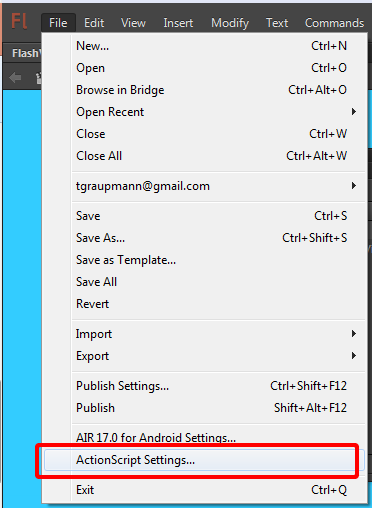 3) Use the File->AIR Android Settings.. menu item to add the signing key. 4) On the General tab click the + button to add the key.der to the included files to reference the signing key. And then click OK.
5) The IAP example modifies the Main.as ActionScript to add an update event that will control the stage text content. The Main constructor initializes the ANE interface and initializes the ANE. 6) In order to receive IAP extents, use the ANE interface context to add a listener to get status events. 7) Context status events provide IAP callbacks and latency free input. The event code indicates the type of event. And the event level was used to pass a JSON string with the data for the event. The example includes all the parsing logic for the JSON responses. IAP methods use the reference to the ANE interface and the context status events to get responses. RequestProducts takes a JSONArray of String product identifiers to get the details about the entitlement or consumable. RequestPurchase takes a String identifier for the entitlement or consumable being purchased. RequestReceipts takes no arguments and the callback gets a list of receipts that the logged in gamer has purchased associated with the package. RequestGamerInfo gets the GamerInfo for the logged in gamer. The GamerInfo holds the gamer UUID and Username. Shutdown cleanly shuts down the ANE interface before exiting. Import the NativeApplication namespace to get access to the singleton and exit method. Shutdown the ANE interface before exiting the application. Adobe Scout is a free profiling tool from Adobe Creative Cloud that allows you to find memory issues and performance bottlenecks in your Air apps running on Android. 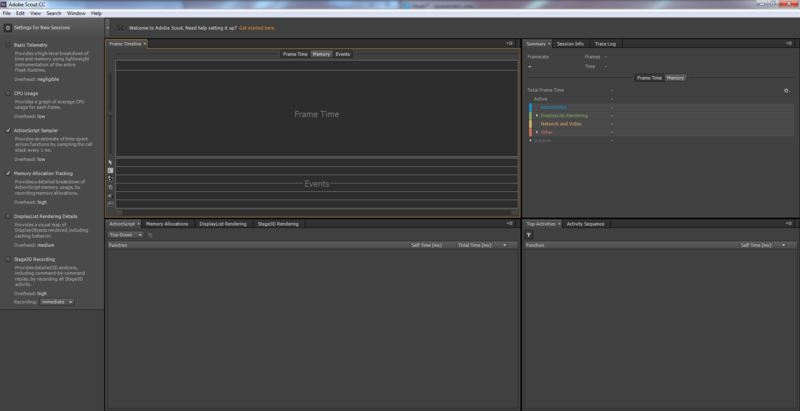 1) You will need to sideload Adobe Scout on to the Forge TV to install the profiler. 2) The sideloaded Adobe Scout will appear in Settings->Apps->Downloaded apps. 3) You will need to plug in a USB mouse into the Forge TV in order to navigate the Adobe Scout application. 4) Use the mouse to check the box next to Enable. 5) You will need to manually enter the IP Address of your desktop/laptop running Adobe Scout which should be running. 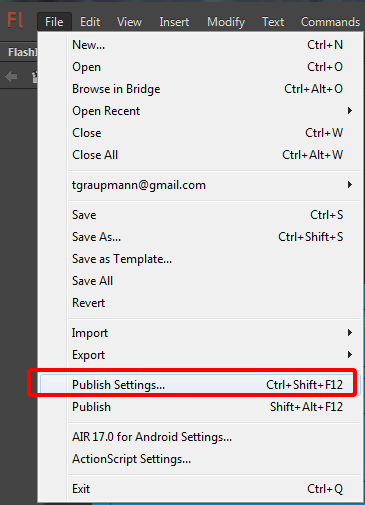 6) In Flash use the File->Publish Settings menu item. 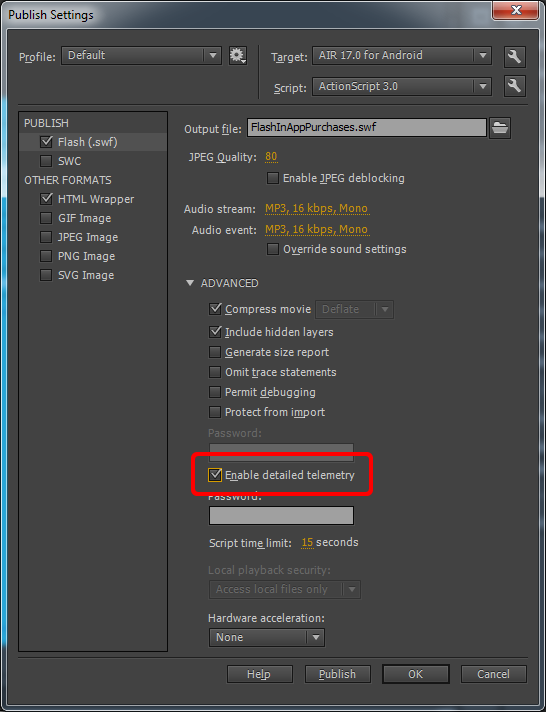 7) On Publish->Flash (.swf) be sure to enable the Enable detailed telemetry and click OK.
8) Republish and sideload the application and upon launch Adobe Scout will auto connect. Using the profiler, it turns out that using the ANE interface to check axis and button states negatively affected performance. ANE calls have a whole lifecycle triggered by each call. And requesting all the axis and buttons for 4 controllers added 36 millisecond of lag each update frame. The lag introduced bad frame rates and input queueing. 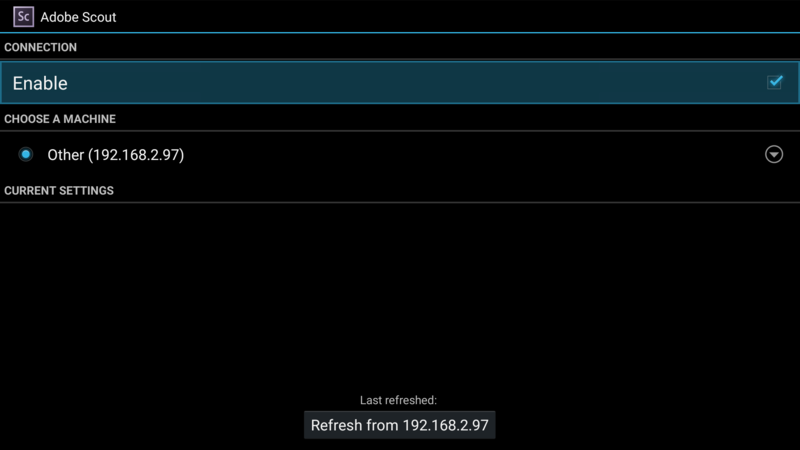 Instead, a context status event was added to provide latency free axis and button events. The following JSON response parsing can be used for input without any lag. 1) Add the context status event in the Main constructor. 2) Add the status event handler. 3) Add JSON parsing methods for input.